For more information, see: Testing of explosives. Hydrodynamic testing uses extremely high speed instrumentation, often with X-rays or protons, to determine fluid dynamics of what happens inside an explosive reaction. It is not limited to explosive speeds; instrumenting the fluid dynamic behavior of models is useful in ship design, weather analysis, and other fields. It may use X-ray, proton, neutron, or other flash radiography to measure, in microseconds or less, the explosive compression of a fissionable material simulant. Depleted uranium, for example, has the same physical properties as enriched uranium, and is similar to plutonium. A related technique, hydronuclear testing, does actually have a nuclear reactions, although very small in yield (e.g., kilograms to low tons). The lowest range are unlikely to be detected, at least by seismic methods. These methods, however, are by no means limited to nuclear weapons. They can be used for studying explosively driven metal forming, such as metal welding. They also can be used to study the characteristics of new types of explosives. Not all testing methods are photographic. 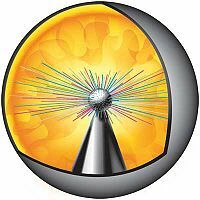 The pin dome method puts conductive pins into a sphere to be imploded, which sense the movement of the shock wave toward the center. ↑ Pike, John. Nuclear Weapon Hydrodynamic Testing. Globalsecurity.org. Retrieved on 2010-05-16. This page was last modified 02:17, 18 May 2010.